While most countries around the world are struggling with an economic downturn, this has not led to a backlash against global trade. In fact, as has been observed in recent American polls, this year there is, if anything, more support for trade than there was in 2008. Most publics continue to see trade as beneficial for their countries and for their families. Nor has the economic crisis led to widespread doubts about the free market. In the vast majority of countries surveyed, most think the free market approach to economics is good for society, even if it produces income inequalities. Still, the new survey finds concerns about the implications of globalization. Large majorities want their government to do what is necessary to protect their country economically, even if that results in tensions with allies. And there are widespread worries about immigration and foreign influences on a country’s way of life. In the wake of a difficult economic year throughout much of the world, support for trade remains high, and in fact has increased in many nations. Majorities in all 25 countries included in the current survey say growing trade and business ties between nations are very or somewhat good for their country. Among the 21 countries included in both the 2008 and 2009 surveys, support for trade has increased in 10, decreased in only two, and stayed basically the same in nine. In 16 nations, at least eight-in-ten say trade is good for their country. Support is especially high in the Asian economic powers of India (96% good), China (93%) and South Korea (92%). In a reversal of recent trends, the largest increase in support for trade has occurred in the United States. Between 2002 and 2008, the percentage of Americans who believed trade was good for their country dropped precipitously – from 78% to 53% – but over the last year, support has risen by 12 percentage points, the largest increase in the survey. 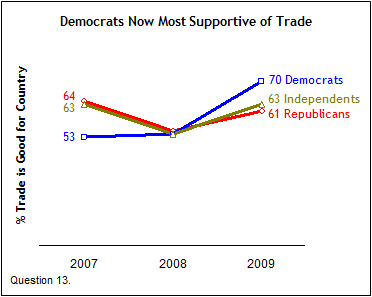 Positive opinions about trade rose most markedly among Democrats. Two years ago, Democrats were less likely than Republicans or independents to believe trade is good for the U.S.; now they are more likely than Republicans or independents to hold this view. At the same time, support for trade has also increased among Republicans and independents, following a decline among both groups last year. There were also significant increases in Mexico (+10 percentage points), Egypt (+10), and Indonesia (+8), as well as in three of the four BRIC nations: Brazil (+7), India (+6) and China (+6). There has been little change in the fourth member of this group – 80% of Russians say trade is a good thing for their country, almost the same as last year’s 81%. Among the countries surveyed, a consensus holds that trade is beneficial not only for national economies, but for individuals as well. Majorities in all 25 nations say growing trade and business ties are having a very or somewhat good impact on themselves and their families. India again stands out in its enthusiasm for trade – 94% of Indians see trade as personally benefiting them – and they are joined in this view by at least 80% of the publics in 12 other nations. In a number of countries people have become more likely in the last year to say trade is good for themselves and their families. This is especially true in the Arab nations of Egypt (+19 percentage points) and Jordan (+13), as well as all three Latin American nations surveyed, Argentina (+10), Brazil (+9), and Mexico (+8). The belief that trade is personally beneficial has also become more common in the U.S. (+8). Americans are about as likely to say trade has a positive impact on them personally (63%) as to say it has a positive impact on the country (65%). 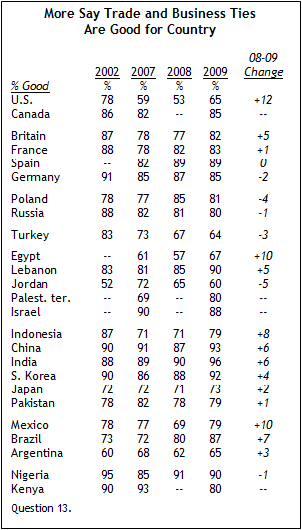 Overall, however, respondents are somewhat more likely to believe trade benefits their country than to believe it benefits them personally – in 13 nations the percentage saying trade is good for the country is higher than the percentage saying it is good on a personal level. There is no country in which people are more likely to say trade is personally beneficial. While there is relatively little enthusiasm for protectionism among the publics surveyed, there is nonetheless a widely held belief that governments should protect their national economic interests. In all 25 countries, large majorities agree that their government should take steps to protect their nation economically, even if other allies object. In 11 nations, majorities completely agree with this idea. Economic nationalism, as measured by this question, is somewhat less intense among European Union members – just 30% of Germans completely agree, along with fewer than half in France (33%), Spain (36%), Poland (41%) and Britain (46%). Similarly, fewer than half completely agree with this view in the U.S. (45%) and Canada (34%). Economic nationalism is least intense, however, in China (26% completely agree) and South Korea (21%). On balance, the global economic downturn has had little impact on support for the free market. In 22 of 25 countries, majorities completely or mostly agree with the statement “Most people are better off in a free market economy, even though some people are rich and some are poor.” Among the 24 nations where this question was asked in 2007 and 2009, the percentage saying they agree has risen in 10 nations, dropped in eight, and remained about the same in six. More than three-in-four agree with the statement in a diverse set of nations. Support for the free market approach is strongest in two of the poorest nations on the survey, Kenya (84% agree) and the Palestinian territories (82%). Palestinians are now considerably more likely to endorse free market economics than they were two years ago, when 66% held this view. Support is also high in the growing Asian giants India (81%) and China (79%), as well as in the U.S. (76%), South Korea (76%) and Israel (72%). Enthusiasm for the capitalist approach is lowest in Japan and Argentina, and it has declined in both nations since 2007. Two years ago, 49% of Japanese said most people are better off in a free market system, even though it may result in inequalities; today, 41% take this view. In Argentina, 43% said people are better off under a free market in 2007, compared with 36% now. There is also less support for the free market now in Nigeria (-13 percentage points), Spain (-10), and Lebanon (-10). This perspective is somewhat less common in EU nations, although even in Germany (62%), Britain (62%), Poland (61%) and France (59%) roughly six-in-ten hold this view, as do 71% in Spain. Fully 69% of Americans think their way of life must be protected against foreign influence, up seven percentage points from 2007. And there have been increases elsewhere as well – in 10 of 24 other nations, more now want protection from foreign influences. The biggest increases in concern about foreign influence have occurred in Israel (+12 percentage points), China (+11) and Japan (+10). Notable rises have also taken place in Pakistan (+9), South Korea (+9), Germany (+9), Mexico (+8), Britain (+8) and France (+7). (-8), Argentina (-7) and Brazil (-7). In 10 countries there has essentially been no change on this question. This sentiment is common both in economically developed nations such as Israel (82% agree), Britain (80%) and Spain (77%), and in less-developed nations such as India (86%), Indonesia (83%) and Kenya (81%). The only three publics in which less than half of respondents favor stricter immigration policies are Japan (44% agree), the Palestinian territories (43%) and South Korea (29%). Roughly three-quarters in the U.S. (74%) endorse stronger controls on immigration, basically unchanged from 2007. In most countries surveyed, there has not been significant change on this question since 2007, although Israelis (+8 percentage points) are somewhat more likely to call for tighter restrictions than they were two years ago and the French (-7) are somewhat less likely. This view is especially prevalent in India (79%), South Korea (75%), Kenya (71%) and Nigeria (70%). However, large majorities agree outside of Asia and Africa as well, including more than two-thirds of Germans (69%) and Poles (68%). The only nations where clear majorities disagree with this perspective are the U.S. and Canada, although since 2007 both publics have become somewhat more likely to believe that success in life is determined by forces outside our control. Two years ago, 33% of Americans agreed that success was beyond an individual’s control, compared with 39% today. Similarly, 34% of Canadians felt this way in 2007, compared with 38% now. 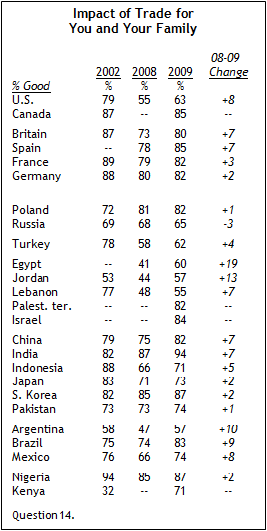 Overall, the publics surveyed have become slightly more likely to believe that success is determined by external factors – in nine countries, the percentage who agree with this statement has increased since 2007, while declining in only one (Lebanon, where the percentage who agree has dropped 15 percentage points). However, even in most countries where there have been increases, they have typically been small. The two largest increases have occurred in Egypt (+12 percentage points) and Nigeria (+7%).